If you haven’t seen Suave perform live, you are truly missing out on a soulful experience! Fortunately for you, Suave will be on stage three times in the next two weeks, so there’s no excuse not to be a part of the Hip Hop Soul Revival movement. On Saturday, March 27, 2010, the bonus track from The Hip Hop Soul Revival EP, Pain B4 Progress, will become a part of the9th Ward Renaissance Art Exhibit at M. Francis Art Gallery (3232 N. Galvez) and Suave will be performing at the exhibit opening from 2pm to 6pm. The exhibit will be ongoing for 3 months, so make sure you stop by to hear Suave’s feature and to support a worthy cause. 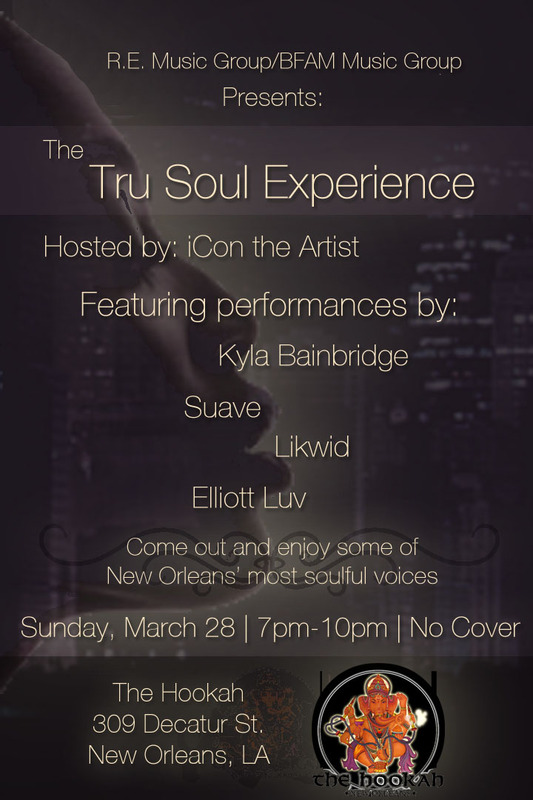 Be at The Hookah (309 Decatur St.) on Sunday, March 28, 2010 for The Tru Soul Experience featuring Suave and Elliot Luv. The night will be hosted by iCon the Artist with guest appearances by Kyla Bainbridge and Likwid & Mario Abney on the trumpet. The show begins at 7pm and is FREE! And if you’ve been waiting for a unique, soulful music event in New Orleans, mark your calendars for Friday, April 2, 2010. Suave and BFAM Music Group will be hosting a night of uncompromising music entertainment at The Howlin’ Wolf Den (S. Peters & Julia Street). The night will feature the premiere of the music video for Suave’s single Suave Is Here, directed by Robert Ra’Bee Carpenter of OUR Entertainment. Stay tuned for more details about what is sure to be an incredible night!